If you live in America, Amtrak Jobs are most likely available in your area. There are typically no less than 200 jobs with Amtrak available throughout the United States on any given day. Amtrak employees can earn anywhere from $10 to $55 per hour, doing just about every type of work you can name. Visit the Career page of Amtrak's website for currently available positions in your area. For Amtrak vacation packages and cost-cutting travel strategies anywhere in America, visit any of the links shown below. For fares and scheduling info on Amtrak, call 1-800-USA-RAIL. Check the website of Amtrak for maps, discount deals, special offers, and other information. Look here for a Complete List of Amtrak Stations. 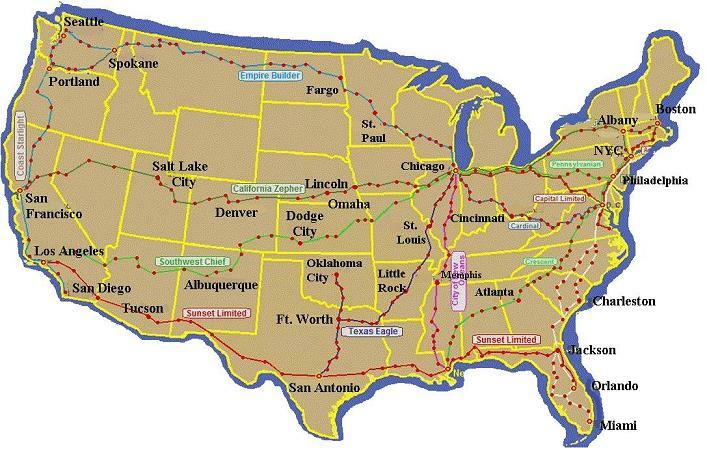 Shown above is a map of all Amtrak Routes throughout the United States. Amtrak trains carry roughly 30 million passengers each year over more than 21,000 miles of track, although only 730 miles of it is actually owned by Amtrak. 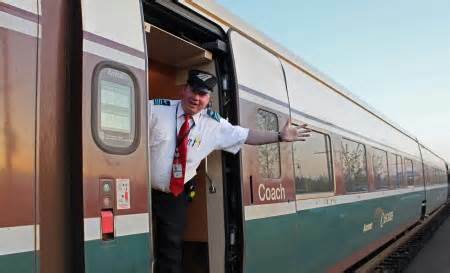 All of the train stations on Amtrak are connected by a "captive" bus service called the Thruway Motorcoach. This company is especially designed to serve Amtrak passengers. The only U.S. states that don't have Amtrak passenger service are Wyoming and South Dakota. Amtrak passenger train service is otherwise widely available throughout the United States. Per passenger mile, Amtrak is 30 to 40 percent more energy-efficient than commercial airlines and automobiles, overall. These days, most Amtrak passengers have access to WiFi throughout the duration of their trip. The headquarters of Amtrak are located at Union Station in Washington DC. Amtrak employs more than 20,000 people in a diverse variety of professions throughout the United States. ...to name just a few specialized fields available to qualified, trained employees. Other types of employment at Amtrak include administrative jobs, sales jobs, cleaning jobs, maintenance work, train station attendant jobs, concession jobs, and numerous other entry level employment opportunities. Visit the website of Amtrak for a complete, up to date list of job opportunities. You can search for jobs either by state or by the type of employment you desire. Amtrak is an equal opportunity employer.